First Officer Julian Rodriguez battles his worst foe yet -- a band of genetically linked mini-brains known as The Relatives! 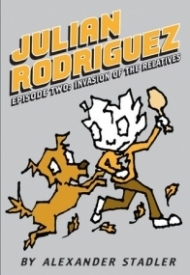 First Officer Julian Rodriguez has seen his share of injustice during his time on Earth, and now he's facing his greatest challenge yet: the invasion of his home base by a group of genetically linked mini-brains known as "the relatives." He's been moved from his personal sleep chamber (bedroom) to a subterranean containment facility (the basement).Then he is forced to participate in a show of ceremonial athleticism (football), and must consume a variety of mystery foods (Thanksgiving dinner). But the ultimate disgrace comes when he is threatened with contamination by mini-brain DNA!